Fashioned more in the spirit of a Saturday afternoon serial than a modern superhero film, Guardians of the Galaxy appears at first flush as the most thorny Marvel Studios movie to make. An offbeat flick about a band of misfits, including a green girl, anthropomorphic tree, humorless hulk and garrulous racoon, set in the not-so-distant future in a galaxy far, far away. In fact, this sci-fi comedy benefits from a connection to the Marvel universe that isn’t as ubiquitous as the mythology surrounding the likes of Iron Man, Captain America and The Hulk. It affords filmmakers the creative latitude to fashion a freewheeling fantasy flick that combines the construct of Star Wars with the idiosyncratic conceit of A Hitchhiker’s Guide to the Galaxy. 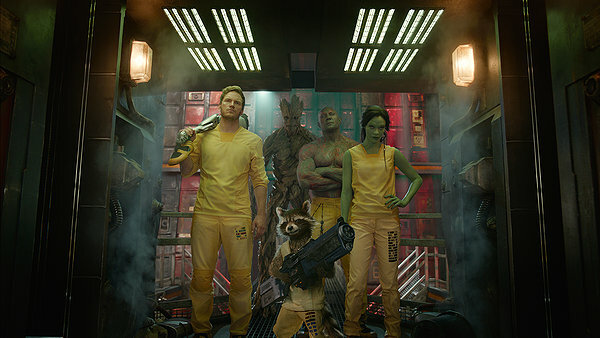 Although Guardians of the Galaxy has been around since 1969, the characters for this film version are drawn more from the 2008 comic book revival. Their accidental leader is Peter Quill, who as a child in the mid ‘80s flees the hospital room of his dying mother only to be abducted by aliens, clinging all the while to his personal totem, a Walkman loaded with an Awesome Music Vol. 1 mix tape. Raised by a band of thieves and smugglers called Ravagers, Quill grows into a resourceful scalawag and scavenger who also fancies himself an space adventurer he labels Star-Lord. We first see the adult Quill (played by Chris Pratt) foraging for a valuable orb, with Redbone’s “Come and Get Your Love” blasting through his Walkman’s headphones. Indeed, Quill’s ‘70s styled dubs, compiled by his mother, serve dual purposes. They remind Quill of a simpler time while also blocking out the otherworldliness of his extraterrestrial life. The orb, which houses one of the six Infinity Stones, soon puts Quill in the sites of Gamora (Zoe Saldana, trading her blue skin from “Avatar” for cold-blooded green), the adopted daughter and personal assassin of Thanos who harbors a secret desire for retribution against daddy not-so-dearest. Meanwhile, a bounty placed on Quill’s head by the Ravagers attracts a couple of mercenaries. Rocket (voiced with gusto by Bradley Cooper) is a genetically engineered, hyper-intelligent racoon. His sidekick is Groot (voiced by Vin Diesel, not that you’d recognize him), a tree-like humanoid only able to garble, “I am Groot,” with Rocket the lone creature who can interpret his varying intonations. A jail break introduces Drax (Dave Bautista) into the mix. Drax, a muscle-bound warrior, wants revenge on Ronan the Accuser (Will Pace), a Kree radical also hunting the orb, for killing Drax’s family. Guardians of the Galaxy has its villain, but the most daunting adversary is the struggle for this flawed quintet to set aside their distrust, selfishness and personal woes to function as a team. Moreover, it’s about the assembly of a surrogate family comprising members wrested from their real families. This journey occasionally takes some dark detours, including a drunken Rocket confessing the physical and emotional pain of his unnatural existence. And at one point, a character commits a sacrificial act to save the others. Quill wants to find his life’s purpose, Gamora secretly wants to feel emotional warmth and absolution for her crimes, Groot longs to find his proverbial voice, and Drax aches to avenge his family. Punctuated by the requisite firefights and action sequences, the whip smart script from writer-director James Gunn and screenwriter Nicole Perlman—the first woman to pen a Marvel movie—is full of charm and swagger. More subversive is the fact that it slyly deconstructs the very sci-fi action tropes it uplifts, from the generic motive of avenging the Death of Family to using an almost-MacGuffin to propel the plot. In one scene, as the ragtag guardians join in a clichéd slow motion group walk (think “The Right Stuff,’ and more than one Quentin Tarantino film), Gamora cuts loose a conspicuous yawn. It’s a malaise the audience won’t share. Guardians of the Galaxy is high-flying fun, but its cheeky, sentimental core is what really sets sail.